As part of the Studio for WinForms control collection, ComponentOne Gauges™ for WinForms gives you an easy way to add linear and radial gauges to visualize data in a meaningful way. Add the gauge to your form and customize shapes, pointers, ranges, and animation to get the exact graphical representation you need. When setting up the Gauge control, choose between radial or linear shapes. Radial gauges can be circular, helical, arc curve, clamshell, or half-circular. Linear gauges can be horizontal, vertical, or tilted. A BulletGraph is a type of linear gauge designed specifically for use in dashboards and information screens. It displays a single key measure along with a comparative measure and qualitative ranges to instantly signal whether the measure is good, bad, or in some other state. Align multiple gauges into one container using the Gauge control. Gauges can be overlapped or placed side-by-side. 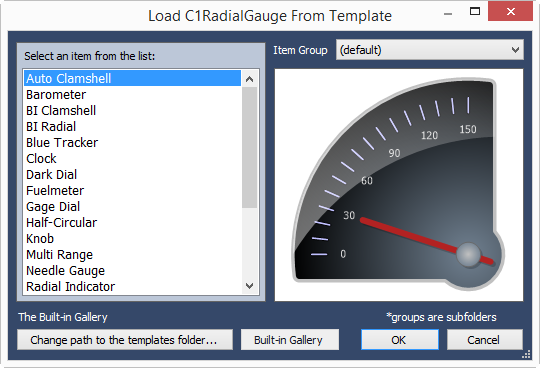 Resize a gauge in any arbitrary way, and each gauge maintains its aspect ratio and relative position. 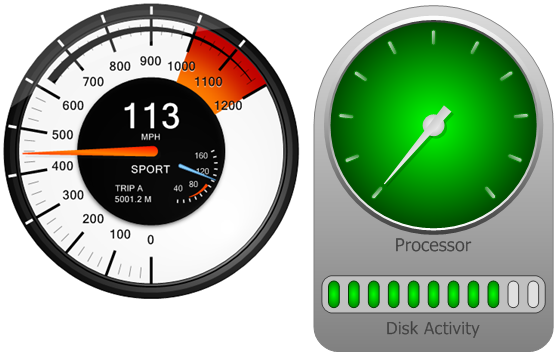 Interactive features allow you to use Gauge for data input. For example, add gauge buttons within the gauge's design to allow users to change values. Gauge pointers can also be dragged at run time with the mouse while optionally snapping to set intervals along the scale. Double-click any part of your gauge and an editor will open to help you quickly set properties. Get started quickly by choosing from more than 70 pre-designed templates. You can also create, save, and reuse your own templates for individual gauges or the entire container control. Add any number of non-linear and linear-shaped ranges. You can customize the exact location, style, and size of the ranges to best suit any desired look. Map colors to value thresholds to display multi-colored ranges. You can even bind ranges to moving pointers for a more dramatic display or to create thermometer and progressbar-style gauges. There is no limit to the number of pointers and scales one gauge can hold. 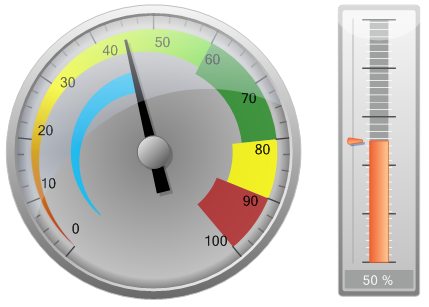 You can add multiple, related scales to one gauge, or overlay multiple gauges for disjointed scales. Scales can be non-uniform: linear or logarithmic. It's also possible to create dynamic scales. You can bind the beginning and ending of a scale to pointers. 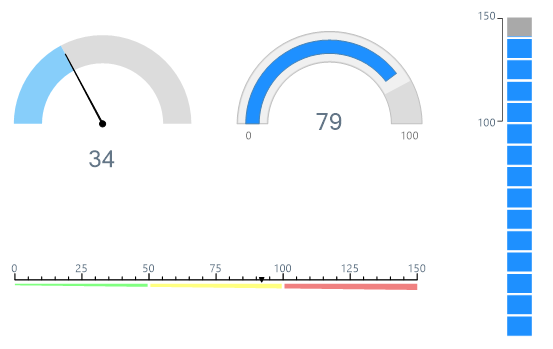 Markers — visual cues that can be placed at specific values on the gauge scale — are useful for comparing the gauge value to some other predetermined or databound value. Customize their look and positioning to fit any desired look. 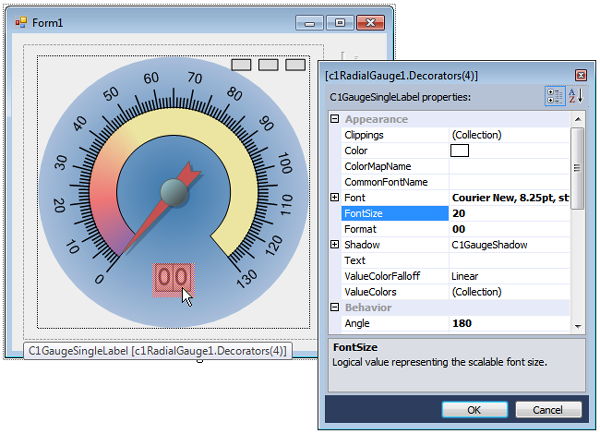 Easily bind the Gauge control to a data source at design time using standard .NET data-binding techniques. You can bind individual pointers to different data sources. Apply standard or custom .NET numeric formats to all gauge labels and value indicators to display decimal places, percents, currency, and more. 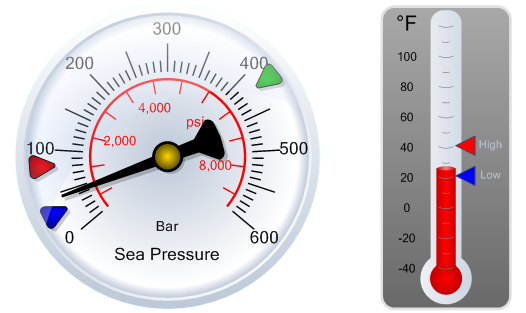 The Gauge control can automatically rotate labels for radial gauges to make them more readable to users. You can specify additional rotation or radial/orthogonal offset to achieve interesting effects. All graphics are vector-based in Gauges for WinForms unless you specify the pixel-based size, enabling the gauge to paint itself perfectly in any size while all the inner elements resize proportionally. Choose from many predefined pointer shapes, customize the shape, or import your own custom image to use as the pointer. Specify the exact position of the pointer origin in radial and linear gauges to decentralize the pointer to either side or the bottom of the gauge.